While I'm waiting for the sun to come out so I can start my next big photo project (photographing every silver polish I own), I thought I'd post one of the best OPI collections to ever be released. OPI It's Summer For Shore collection. Aren't those incredible? OPI Needs to release more like that. Sure, they have the Designer Series, but they're twice the price. I love the old OPI formula and brushes. These were so easy to apply. I miss it. Needs. Blue. Moon. Lagoon! Really!! it's amazing. Be nice if that was all that it took. However it was an FDA law that was passed. The polishes could not be sold after a certain date if they contained any of the chemicals we now call 3-Free. They all have been linked to being carcinogenics. I should add - I ADORE the older formulas too (not so much where they were with what they could produce, though this collection and early DS shades showed OPI COULD do a lot more than they were typically giving us. I remember so well through the early days and into all of the 90's pretty much - OPI gave on their literature for collections and (S) to indicate it was a shimmer...that's how little of shimmer there was in a lot of the shades! You needed to really look hard and often rely on that S to tell you if it was a frost, pearl (and both those looked alike at times), or a S. The creams were pretty easy to ID however from just a look at the bottle typically - but a few would fool me, thinking it was a cream and darn if it was not a S!!! Sand-erella, got to have it! I also like BML a lot. I *think* I can do without What's dune, but Sandy.. come to mama!! They really are amazing! I don't own any of those. 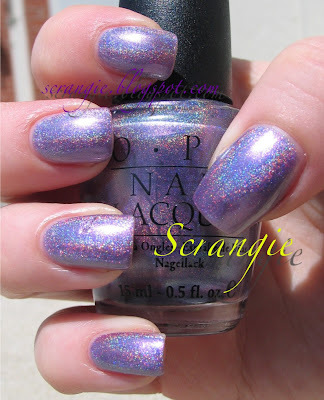 I think OPI should rerelease some of the popular HTF or d/c ones! Mizzx, What's Dune is nice, but it's so sheer you have to wear 5 or 6 coats of it to look like you're wearing it. If you can't get Sand-erella, Designer Series Original is somewhat similar. OPI needs more colors like these! Sanna, you're right! They should. I wonder if we wrote enough letters to OPI if the would consider doing it? 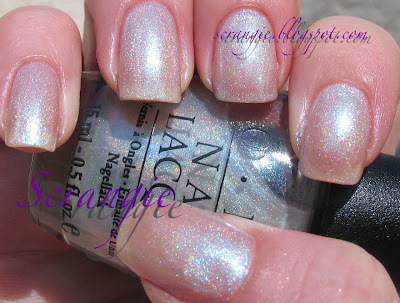 I would LOVE to think a social media campaign would nudge OPI into re-releasing a lot of the old fab shades. You KNOW they would sell IF they listed to their customers and chose the right shades. I so love DS Original, that's why I'd love Sand-erella too.. It's good they do have dupes for those old ones..kinda. I think I will write a letter to OPI. I've been thinking about it for a while! do these differ from the designer series at all? i was interested in "original" from the ds collection but sand-erella seems to be the same exact thing. is the ds one more holographic? or does it need less coats? whats the difference? Elle D., the Designer Series is, for the most part, less sheer. The shades are slightly different and some of the Designer Series seem more densely holographic. If you already have Sand-erella, you probably don't need Original. If you don't have Sand-erella, get Original because all of these polishes (It's Summer For Shore) are discontinued and extremely hard to find! Strange. I find the opposite to be true about the sheer-ness of this line v. the DS line. I have DS Divine, and I swear I need 3-4 coats to get it to look anything close to the bottle. Anyway, I have sanderella on right now (and I have the whole collection, bought off ebay 3 years ago, LOL, for around $25, gave BML to a friend though, I don't do blues). 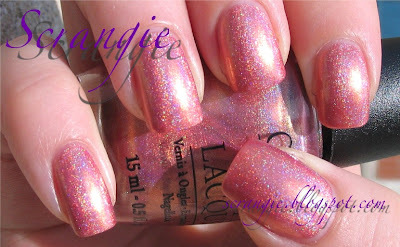 This collection, as well as the DS, definitely does not hold up as well as other opi polishes in my opinion. Which stinks, because I LOOOOVE these, especially Crim-Sun. I have under half a bottle left, and have been using it very very sparingly. Of course, I don't use acrylics, and I know lacquers don't adhere as well to natural nails. 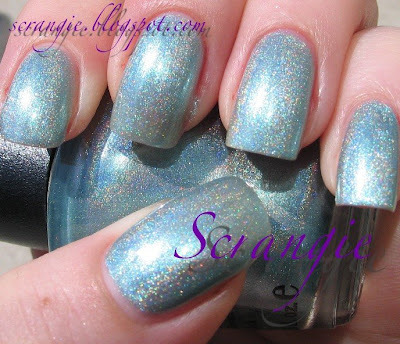 Oh, and by the way, I found your blog by googling sanderella so I could show a friend of mine the color. Nice place you have! Your blog is probably going to cost me a WHOLE LOT OF MONEY! LOL! Razberiswirl, I agree, some of the Designer Series are pretty sheer, but not all of them. I don't have acrylics and don't usually have a problem with OPI lasting as long as I use a good basecoat and topcoat :) And thank you!! I also really miss the old formula not just in OPI but in China Glaze - however I think most of the time, CG has nailed the new 3-5 free formula better than many companies have. I wish I had been well, not involved with major illness & broke from that too, so that I was not at all keeping up with what OPI released. I totally missed this - plus I was still stuck wearing what were 'my shades", reds, mauves and not advanced enough to be wearing blues or purples. I was too sick to even know about the DS line or linear holos. I love this collection now but won't ever be able to spend the $ to purchase it if you can even find all the shades that is.